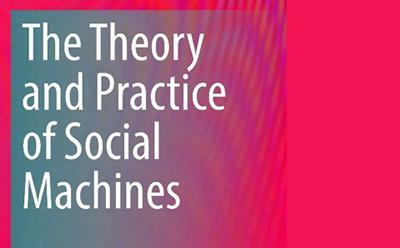 A new book "The Theory and Practice of Social Machines" has been published by Springer. This is an exciting new output from the SOCIAM project in which the University of Southampton was a partner. The term "Social Machines" was introduced by Tim Berners-Lee in 1999. Today we see them as networks of people and devices at scale, their behaviour co-constituted by human participants and technological components. They harness the power of the crowd, with everyone able to contribute - to document situations, cooperate on tasks, exchange information, or simply to play. Existing social processes may be scaled up, and new social processes enabled, to solve problems, augment reality, create new sources of value, or disrupt existing practice. The new book is the fullest and most complete discussion of social machines yet written. It is authored by Nigel Shadbolt, Kieron O'Hara, David De Roure and Wendy Hall and is in the Lecture Notes in Social Networks series. It describes the set of tools and techniques developed within SOCIAM for investigating, constructing and facilitating social machines, considers the ethical issues relating to privacy and trust, and speculates on future research trends. The SOCIAM Project, which was directed by Professor Sir Nigel Shadbolt, ran from 2012-18 and was funded by the EPSRC. The academic partners were the University of Oxford, University of Southampton, and University of Edinburgh.